Nav Bhatia spends more than $300,000 a year on Toronto Raptors tickets and gives away many to youths. 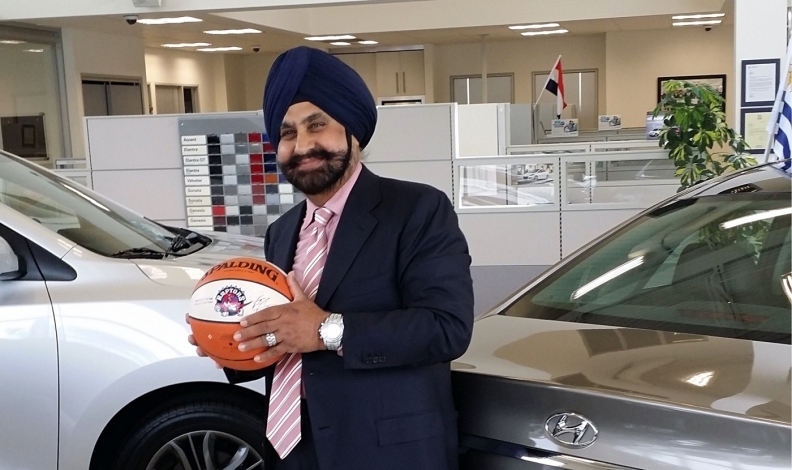 Meet Nav Bhatia, a superfan of the Toronto Raptors professional basketball team, and a super dealer for Hyundai Canada. The 66-year-old native of India walked the red carpet in September at the 2017 Toronto International Film Festival because he was part of the documentary about Raptors’ great Vince Carter. A few weeks later he was chosen to be photographed with former U.S. President Barack Obama at an event in Toronto. Obama, who is a basketball fan, told Bhatia he recognized him from being courtside at televised Raptors’ games. Sports and celebrity aside, Bhatia is first and foremost an auto dealer, owning and operating Mississauga Hyundai and Rexdale Hyundai in the Greater Toronto Area. The Rexdale dealership is where he began his career selling cars in Canada 34 years ago. He became the company’s top salesman in Canada. He sold nearly 150 cars in four months and was promoted to general manager. He took over the dealership about six years ago. 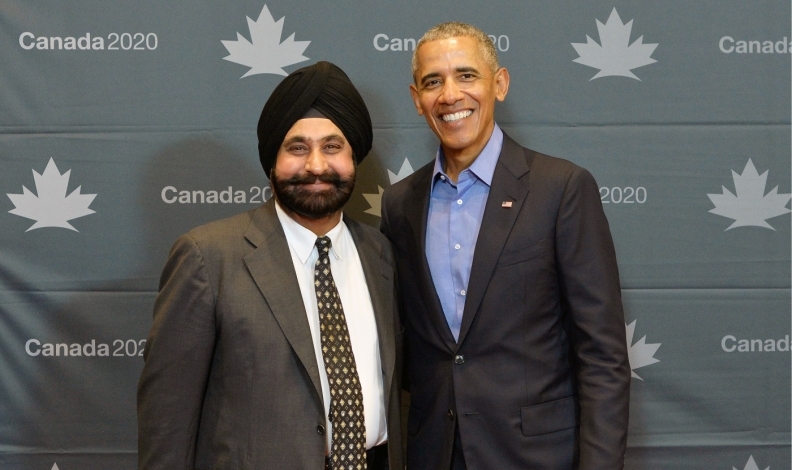 Nav Bhatia was chosen to be photographed with former U.S. President Barack Obama at an event in Toronto. He has been one of Hyundai’s best volume retailers in Canada, first in the country in 2013 and 2014, and tops in Ontario the last five years. Bhatia embraces being No. 1, which he signifies with a raised index finger in newspaper and bus advertising. He spends about $200,000 a year on advertising, some of it paid for with funds from Hyundai Canada. He also spends more than $300,000 a year on Toronto Raptors tickets and gives away many to youths. Don Romano, CEO of Hyundai Canada, lauds Bhatia. Bhatia is humbled by Romano’s words. His formula for success in the automotive business is to treat people like you want to be treated yourself. He believes people buy cars from him because they feel comfortable. “They feel that they will be taken care of, and I try to do the best pricing,” he said. “We are open seven days a week, and customers understand I am reachable. Ninety per cent of the dealer principals are not reachable. Customers know they can talk to me any time, and I think it also helps to be the superfan. He is committed to creating education and awareness about Sikhs living in Canada because of an incident in 1998 in which he entered a store and a customer approached Bhatia thinking he was a cab driver. Bhatia wanted to help break that stereotype. “I want the community to know Sikhs can become cab drivers, factory workers, janitors, but they can also be doctors, pharmacists, car salesmen, dentists ... anything,” he said.